We offer additional courses to extend your skills in preparing for future study or entering the workplace. Further Mathematics provides a great opportunity for enthusiastic mathematicians to broaden and deepen their subject knowledge. All students study the same core mathematical content, which makes up 30% of the content in year 12. There is some choice over the remaining content of the course which might include further study of pure mathematics, statistics, mechanics or other areas of mathematics. In year 12, topic areas studied include complex numbers which, through the introduction of ‘imaginary’ numbers, allow the solution of a range of equations that would otherwise have no solutions, and matrices which consist of grids of numbers that can be used to represent transformations and are used to solve simultaneous equations (amongst many other uses). Other areas of pure mathematics that are covered include polar co-ordinates, differential equations and hyperbolic functions. Each of these builds on earlier topics and encourages the development of a wider understanding of the ways in which mathematical topics are interconnected. university websites to check for any special rules relating to Further Mathematics. Entry requirements: 5 Grade 5 GCSEs including a Grade 7 Maths and you must also study Maths A Level. This is a Level 3 course for students who achieve a Grade 4 or above in GCSE Maths. The qualification is designed to prepare students for the mathematical demands of work, study and life. The skills developed in the study of Mathematics are increasingly important in the workplace and in higher education; studying Core Maths will help you keep up these essential skills. However, Core Maths should not be seen as a replacement for A Level Maths but rather to complement other A Level choices where Maths has not been chosen. Core Maths follows a two year specification and has been designed to maintain and develop real-life maths skills. What you study is not purely theoretical or abstract; it can be applied on a day-to-day basis in work, study or life and will include a financial maths element. It will also help with other A Level subjects, in particular with the Sciences, Geography, Business Studies, Psychology and Economics. Most students who study some form of Maths after GCSE improve their career choices and increase their earning potential. Many roles in today’s workplace require high levels of budget management and problem-solving skills; Core Maths will be a useful tool in equipping you with these skills. The course has been developed with employers, universities and professional bodies as valuable preparation for Higher Education and employment. Entry requirements: Minimum Grade 4 in GCSE Maths. 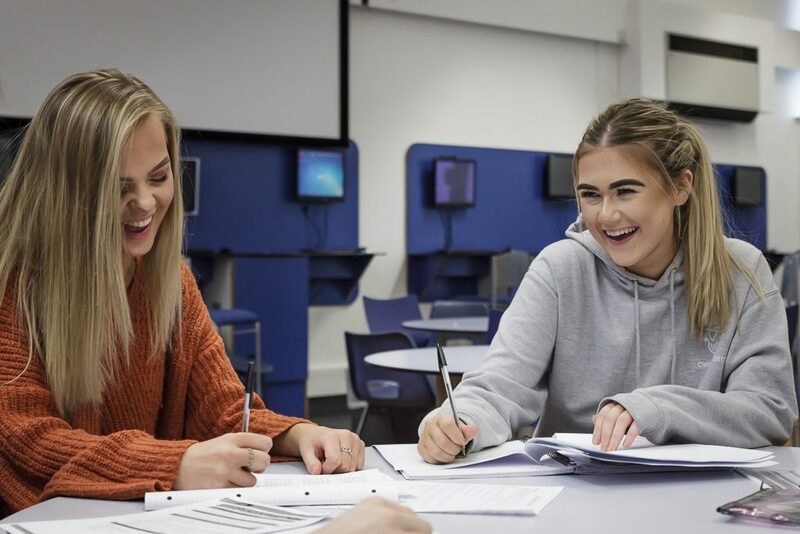 Extended Project Qualification is a Level 3 course for students which allows them to extend their abilities beyond their subjects and prepare for university or their future career. It is worth half an A Level (28 UCAS points) so can be used to earn extra UCAS points. An increasing number of universities are including the EPQ in their offers to students. “Nearly 1 in 5 successful applicants to Durham had completed the EPQ” – Durham University. Entry requirements: Minimum Grade 4 in GCSE English.